It is the Valentine's Day!. Aside from wearing red, I guess the best thing to do is wear any accessory with the symbol of love on it. 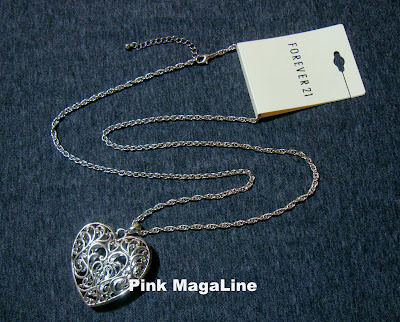 This heart necklace is one of my latest finds from Forever 21. What can I do? Even I swore to limit my Forever 21 shopping, I just can't resist it because they have lots of fab items. I bought this necklace with a huge heart pendant for.. arghh, I can't remember the exact price. It was over P300 I know. I wore this necklace for a couple of times already and I say it's best to match with a plain tee and a printed bottom. For those who don't have a Valentine gift yet, hunt for a jewelry with the heart symbol now. Bet it fancy or gold, the important thing is how much you care for and love that person. Enjoy the rest of the love month. Muah! That's the one you wore at ParenTIN.tv event, right? Really nice! I was looking for a heart necklace, too! ang ganda :) kaso ang leeg ko d ata sanay sa borloloy..nangangati eh :( gusto ko ng mga ganyan!